UN High Commissioner for Human Rights Zeid bin Ra’ad Zeid al-Hussein addresses the press in El Salvador. “Twenty-five years after the end of the civil war, El Salvador has proven itself to be a functioning democracy that honours freedom of expression and where the political discourse is vibrant,” said UN High Commissioner for Human Rights Zeid Ra'ad Al Hussein in his end-of-mission statement. “In my meetings with President Sánchez Cerén and his ministers, I was told how the fight against violence, in particular gang violence, is a priority for the State,” Mr. Zeid added. Despite the introduction of the 'Safe El Salvador' Plan that aims to curb and prevent violence, the level of violence in the country remains shockingly high, he said, citing reported deaths of more than a thousand civilians and 45 police officers in armed confrontations between the police and alleged gang members from January 2015 to February 2017. There are also alarming reports of extrajudicial killings and the return of death squads. Regarding the extraordinary security measures, which since April 2016 have placed thousands of people in prolonged and isolated detention under inhumane conditions, Mr. Zeid called on the President to end these measures and grant international independent organizations, including his Office (OHCHR), access to these detention centres. The vulnerability of these inmates is highlighted by an outbreak of tuberculosis, affecting more than a thousand inmates, with several hundred also said to be suffering from malnutrition, he noted. “El Salvador has the awful distinction of having the highest rate of gender-based killings of women and girls in Central America – a region where femicide is already regrettably high, as is impunity for these crimes,” Mr. Zeid pointed out, noting that investigation, prosecution and punishment of such crimes can help to counter the perception that violence against women is tolerated. As for the country's absolute prohibition on abortion, Mr. Zeid said that some women were convicted of “aggravated homicide” in connection with obstetric emergencies and, as a result, are serving 30 years in prison. He went on to call upon El Salvador to launch a moratorium on the abortion ban and review all cases where women have been detained for abortion-related offences. Such a review could be established by presidential decree. 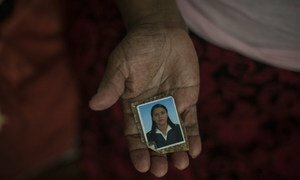 El Salvador is suffering a 'hidden tragedy' due to gang-related violence, an independent United Nations human rights expert today said, urging national authorities to intensify efforts to help and protect people affected by gangs.